All trips last two hours. In two hours you will visit two to three bars. The prices below include use of the bike, driver and sound system. Mon & Tuesday …….. $299.99 **plus gratuity, traditionally $6.00 a person. Wed & Thursday ...... $349.99 **plus gratuity, traditionally $6.00 a person. Friday to Sunday ...... $389.99 **plus gratuity, traditionally $6.00 a person. What Bars Do You Go To On The Canalside Bar & Pub Crawl? Canalside favorite stops include Templeton Landing, Labatt Tap House, 716, the Hatch, Liberty Hound and Pizza Plant. Note,bar choices near Canalside are limited when concerts are held due to closing of streets. 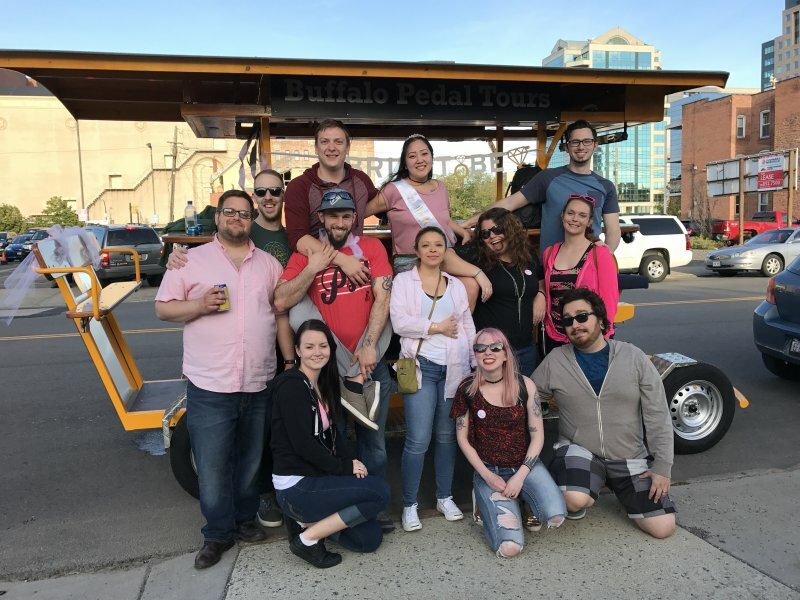 Get your friends together and explore the bars around Canalside in Buffalo, New York on our 15 person party bike! Cruise the streets of Canalside Buffalo and enjoy our waterfront bike pedal tours. Buffalo boasts an eclectic array of bars, pubs, and lounges that cater to craft brew enthusiasts and tavern traditionalists. Whatever your brew style, you’ll find new haunts, restaurants, and beer gardens to enjoy when you pedal the town with us. We regularly host pedal pub crawls for groups of friends or organizations. Bring beer, wine, hard cider, and snacks for the ride (please no mystery drinks, liquor, glass or jell-o shots). Free cups, ice and coolers! You play the music on our Bluetooth sound system! We love Buffalo and our canal area continues to be a vibrant part of town that’s filled with excitement and trend-right attractions. A pedal bike tour gives groups the opportunity to hang out together in a fun-filled part of the city that offers so much to explore. We have been biking the area for four years now and the fun never gets old. Call us to book your Canalside tour during the warm weather season and create an interactive experience for your friends to enjoy. Book Your Pedal Bike Pub Crawl Tour Along Canalside Today! Most of our tours are two hours long. You play your music on our Bluetooth sound systems. We encourage you to decorate the bike for your special occasion. For night tours, you can take in the awesome laser show on the grain silos. If you’re looking for a customized pedal bike tour, call us to work out the details. We’ll do our best to accommodate your group’s needs and look forward to being your DD! We have six bikes and if you plan on renting multiple bikes at once we recommend to book sooner rather than later!